The Hamilton Pan-Europ Day-Date brings back the most colorful decade in watch history. How did this vintage-inspired timepiece fare in our test? Read on to find out. 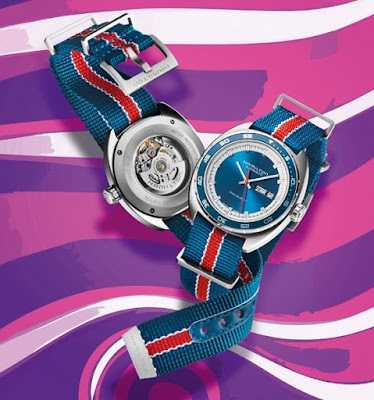 When we think back to the watches of the 1970s, we think of bold colors, rich contrasts and unusual shapes. Bright blue and red played big roles in the decade’s color schemes. Contrasting colors for indexes and subdials ensured good legibility. And many cases were oval. The modern Pan-Europ Day-Date lacks a chronograph but has a power reserve of 80 hours. These traits unite in the new Hamilton Pan-Europ Day-Date, our test watch, as they did in the original model from 1971. Although the original Pan-Europ was a chronograph, which was updated in 2011, the modern version of the Pan-Europ (released in 2014) has a date display and a day-of-the-week indicator. It’s priced starting at $1,095, which we found impressive, not only due to the watch’s elaborately crafted and multifaceted case, but also because of its movement: automatic Caliber H-30. ETA introduced the caliber as a further improvement of its day-date Caliber 2836. The goal was to extend the movement’s running time from 38 hours to 80 hours, long enough so the watch could be set aside over a weekend and still be running Monday morning. ETA achieved this for Hamilton (and for the other brands in the Swatch Group) by slimming the barrel’s arbor so a lengthier mainspring could be wound around it and by reducing the balance’s frequency by 25 percent: from 28,800 to 21,600 vph. The latter modification required a new oscillating system (i.e., the balance and its hairspring), as well as new gears to alter the transmission ratio in the gear train. ETA used this opportunity to install a technically more elegant fine- adjustment mechanism. Instead of giving the new caliber a conventional pincer-shaped regulator and an eccentric screw, ETA opted for a freely swinging Glucydur balance with eccentric weights on two diametrically opposite spokes. These two weights can be turned with a watchmaker’s screwdriver, thus altering their center of gravity and modifying the balance’s oscillating behavior. The watch’s rotating bezel is made of aluminum. While these modifications required adding a bit of thickness to the movement, from 5.05 mm to 5.22 mm, it’s hardly noticeable on such a big, sporty watch. A unidirectional rotating aluminum bezel has been added as well. But the watch can’t be used for diving because its water-resistance rating is just 50 meters. Yet the rotating bezel is a plus since it allows the wearer to measure short intervals. The case is built to keep out sprayed water and the textile NATO strap (both versions pictured below) suffers no ill effects from contact with liquids. The strap runs through three faceted metal “keepers,” its holes are reinforced with leather, and the shaped metal strip at its end is more elaborately styled than on most NATO straps. However, the usual problem remains: the strap runs under the caseback, thus blocking the view of the movement. Another drawback: the protruding metal keepers tend to snag the wearer’s shirt cuff. And we saved the worst news for last: a pivot broke off the crosspiece on the clasp soon after we’d begun testing the watch, so the pronged buckle fell off and could no longer be secured. Fortunately, the watch also comes with a leather strap (both versions pictured below). It has a folding clasp that opens on one side and is much more convenient, sturdier and easier to operate. The downside is its color: black, which doesn’t go well with the watch’s blue dial. The textile strap is a better match. Our recommendation for Hamilton: offer this model with a blue leather strap in the future. The Pan-Europ deviated from timekeeping perfection by just two seconds in a 64-hour test period. Can the Pan-Europ keep its promise of continuing to run for 80 hours after it has been fully wound? Yes, but just barely. Left lying motionless after being fully wound, our test watch stopped running 80 hours and 15 minutes later. Its timekeeping precision throughout this interval was quite impressive: locked inside a safe with its dial up from 5 p.m. Friday until 9 a.m. Monday, the timepiece deviated from perfection by only -2 seconds during the entire 64-hour interval. The corresponding value when tested on the wrist was higher: -2 seconds per day, regardless of whether the watch remained on the wrist throughout the night or was left lying atop a night table. A number in the minus column during daily wear (i.e., when its mainspring is usually fully wound) must be judged as a shortcoming. But we’re inclined to be lenient with the Pan-Europ: after all, what difference do two brief seconds make for a watch that so attractively points our gaze 44 years back in time? U.S. corporations are reportedly hiding $1.6 trillion in profits offshore. Pepsi got its name from the digestive enzyme pepsin. Cereal is the second-largest advertiser on television today, behind automobiles. Taco Bell has proved to be a huge flop in Mexico, as Mexicans were confused by the Americanization of their traditional cuisine. The iPad 2 would cost $1,140 if it were made in America.